thoughts & happenings: Wodonga, Victoria. Been a very busy time since arriving home from our long holiday. Youngest son has come home to live for awhile plus his 3 little ones come and stay here a couple of times a week 2 nights at a time, that makes 4 extra in the house - but it's good fun for us even though much more work is involved it keeps us busy. Whilst we were away two of my Aunties passed over to the other side, one was nearly 99 the other was 82, both my late mother's sisters mum being in the middle. Then two other friends died whilst we were away. Yesterday being Sunday we went to Hobart for the day and had High Tea at Claremont House at Claremont just before you get to the city of Hobart. Both Aunties had private funerals. 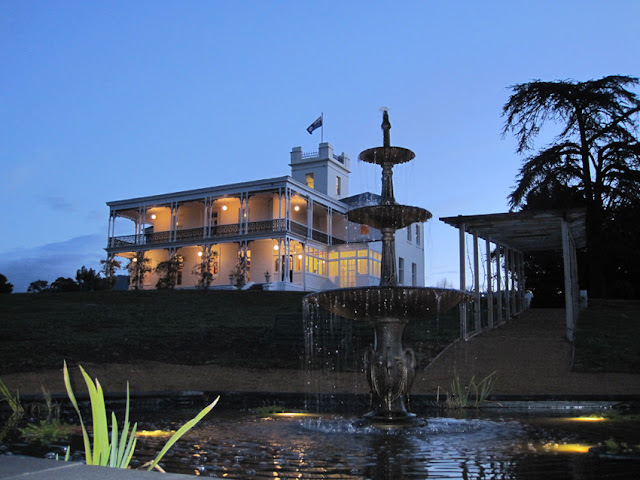 Below is Claremont house - photo borrowed. Another thing that happened and of course not as bad as the above was one of my external Hard Drives decided not to work thus loosing everything, today good news, plugged it back in and all this working so I'm doing a backup! Always pays to just incase. On June 29, 2017 we headed to Wodonga for 2 nights. Still cold we had to buy another portable heater as the one we had went bung! The new one wasn't real good either and has since been returned and money refunded. Bought another blanket as forget to bring the one from home which was the only thing we had forgotten to take. 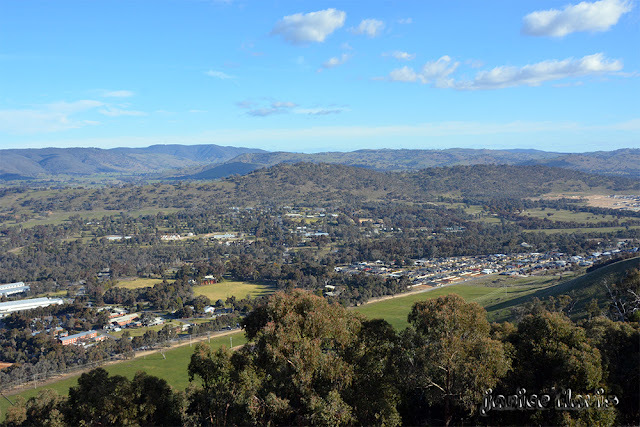 Wodonga, Victoria itself is not far from the NSW (New South Wales border) with the city of Albury being a twin city in NSW. Wodonga has about 38, 600 people and Albury about 90,000 people. 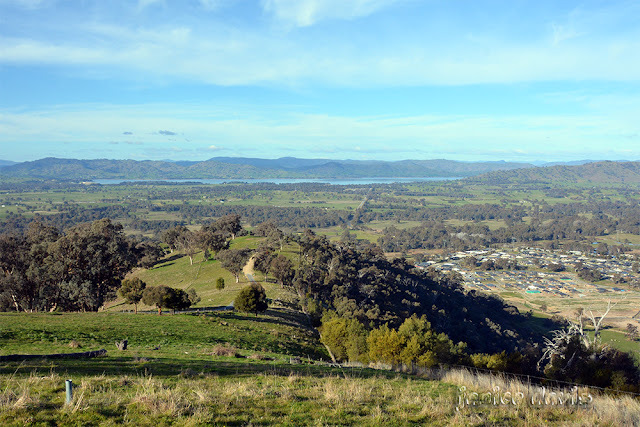 Whilst in Wodonga we went to Huons lookout with it's rather pleasant views of Soldiers quarters and a small area of Hume Lake. 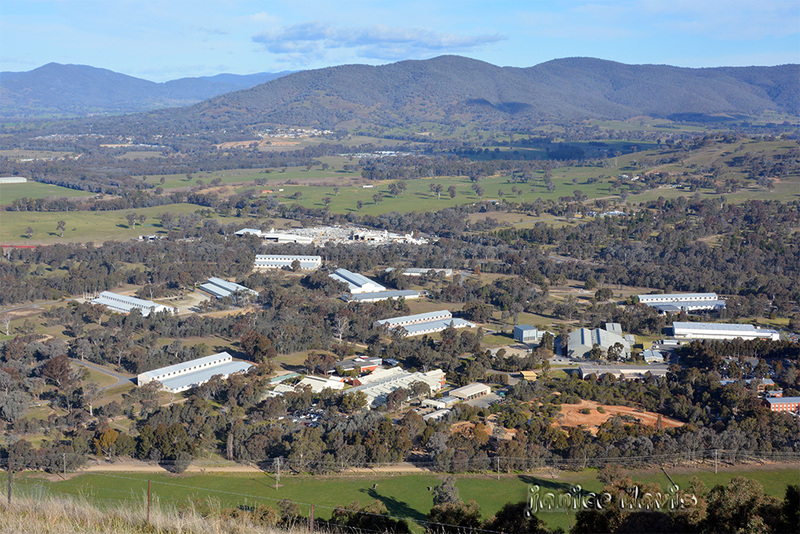 'Major secondary industries based in Wodonga include a logistics distributions hub (LOGIC), a large cattle market, a pet food factory (Mars Corporation), a can factory (Visy), a cardboard box factory (Visy Board), a hydraulic hose manufacturer, an abattoir, and a foundry Bradken Limited as well as a variety of other, smaller enterprises. It also serves as a central point for the delivery of government services to the surrounding region. 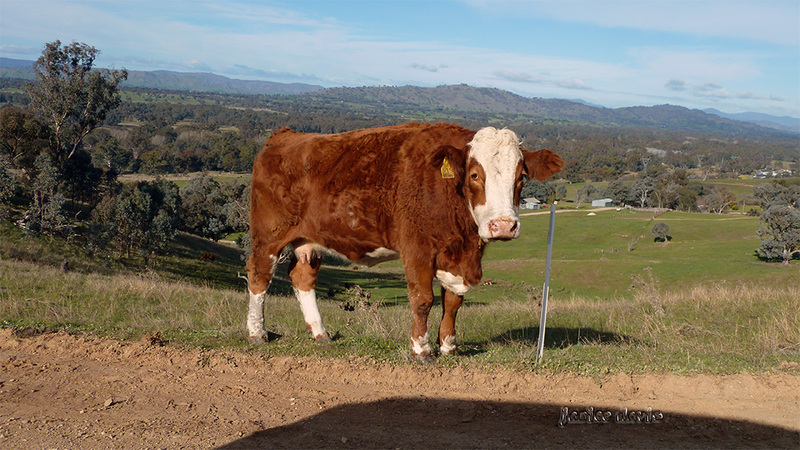 On the drive up to the lookout this cow posed for the camera. My goodness. You have had a busy time, and it has been a very mixed bag of business too. My sympathies on your losses. Love the quintessentially Australian scenes here. Found the 'cow' I took to post and nearly forgot it. Sorry to hear about so many deaths. I am reading the subtext about your son, but maybe you have mentioned it already and I have forgotten. It happens, often. 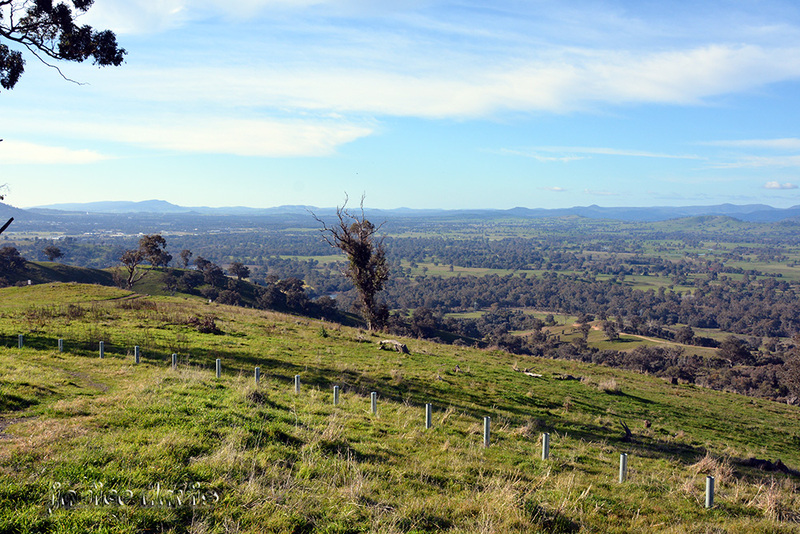 What wonderful views from Huons Lookout. The countryside looks so luscious. Son, yes it happens but he's ok which is half the battle. Was lovely and green up at the lookout the cow was a surprise. We passed through Albury/Wodonga once on our way from Sydney to Puckapunyal, we stopped for a pancake breakfast, but I don't remember which side of the border we were. My daughter had a 4TB hard drive fail and she lost all the movies she had stored on it, so she sent out a list and we all brought her whichever moves we had from the list and she stored them on a new hard drive. Nice to have little ones in the house again, for a while. It had been a long time since we had been up that way, not a lot of it was familiar. What a good idea to get her movies back - nothing is truly safe in storage anymore, one just never knows. Was a surprise to see it up there. Focus on the good ones. Always good memories from my Aunties and friends :) Thank you. Menos mal que todas las noticias no han sido malas. La llegada de tu hijo con los niños te ha proporcionado una gran alegría, aunque eso suponga aumentar tu trabajo. Las buenas imágenes no dejan de acompañar, tu interesante entrada. No matter how bad news is sometimes there is always good. It seems life brings losses of all kinds... But your pictures were most enjoyable. I back up my pictures-- both raw and finished-- once a month. I have a number of music files because I do a review blog, but those files are GIANT and besides that they are easily replaced. I only back up the monthly blogs-- including the music files reviewed. Anyway--- I hope things return to smooth and happy around your life. Good on you for backing up. I am sorry to hear about you dear Aunts and friends Margaret! Who can escape the final destination dear. Cow looks familiar (saw her in mirror i think :). Absolutely lashing and worth visiting place! Goodness, reading your post you have had a busy time, and quite a mix of things to deal with. Sending good and positive thoughts to you. Loved all of the photographs you've shared and isn't Wodonga an unusual sounding name. Some strange saying names in Australia.